I haven't run out of buildings! Thanks. Roger. NPN, If you really have run out of superlatives, you could try the Scots' expression: "Aye, no' bad; no bad at awe". I don't believe there to be an exact Anglice. Again, this is simply fantastic work. 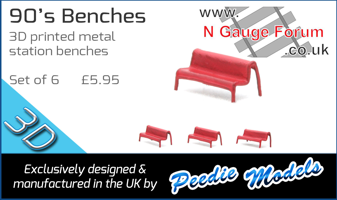 This will go at the right hand end of the layout. 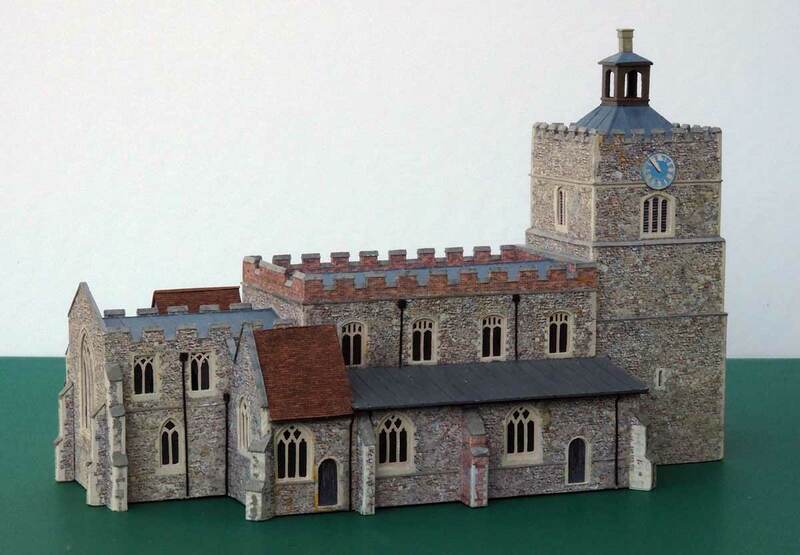 It was built during May and June 2015 and is inspired by, but not an accurate model of, the church in Finchingfield, Essex. 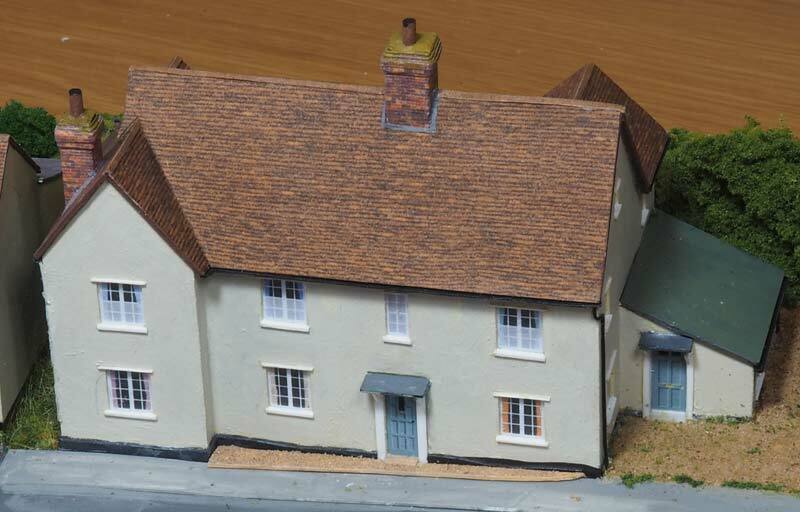 At about eight inches long, this is the largest and most complex building for the layout. 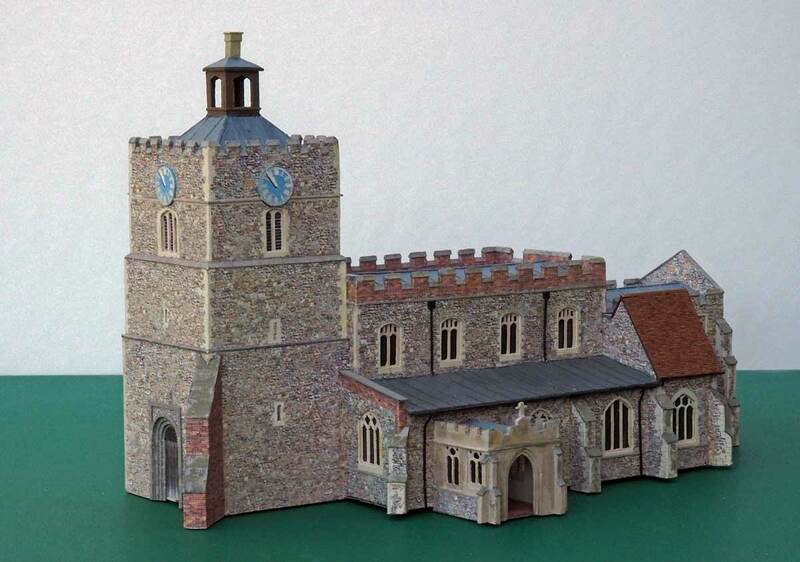 Like many East Anglian churches the prototype is quite large for the size of the village it serves. I had to reduce the size overall by about 10% and shorten the nave (four windows each side instead of five) and the chancel (three instead of four). Hopefully something of the character of the original has been retained. 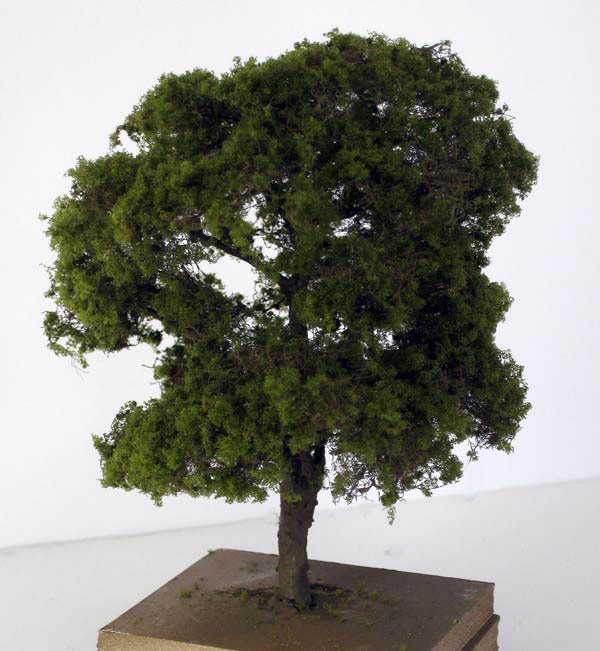 It took about seven weeks to make the model, but I'd already spent ages making and modifying drawings and assembling paper mock-ups. 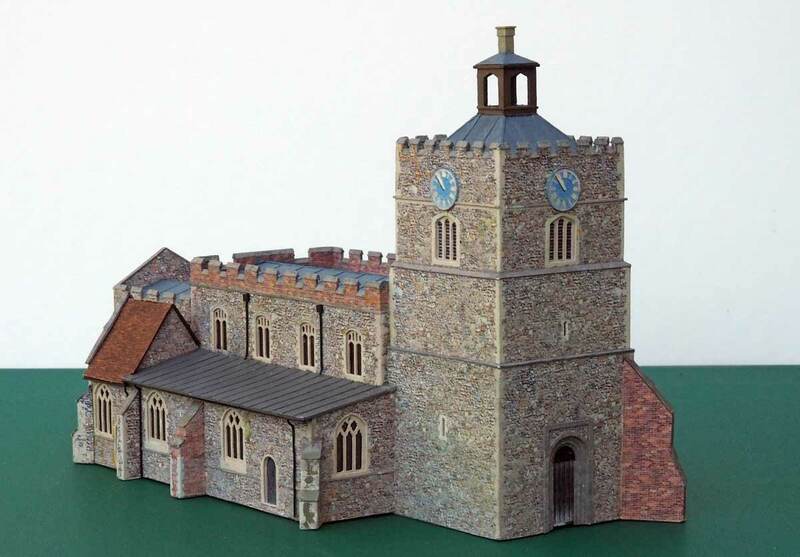 It was built in sections - the nave, chancel and tower were made as separate units and, when glued together, the side aisles and chapels were added. All the windows are cut out, not printed using my usual cheating method. The Silhouette cutting machine really came into its own for this job. 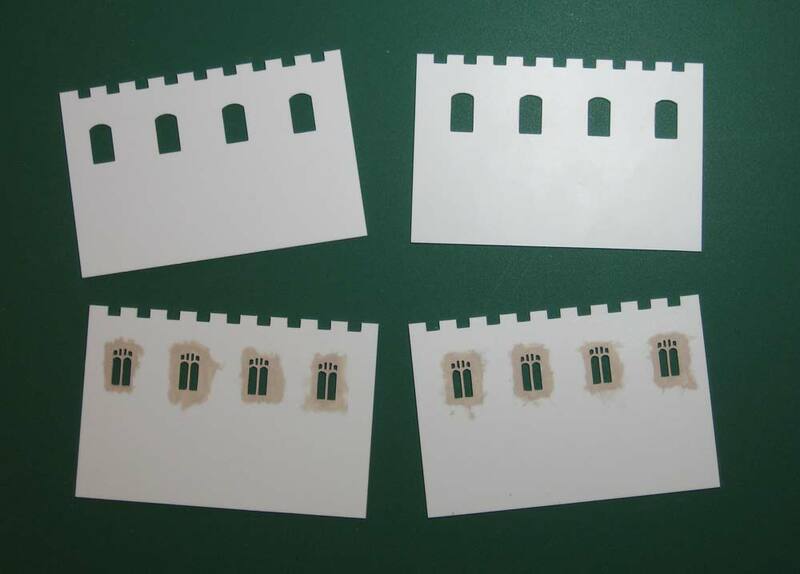 The walls are two layers of 20 thou plastikard, the outer one having cutouts for the windows and the inner one having the tracery of the windows, much simplified of course. There are ten different shapes of window around the building. Fortunately I had lots of photos of the real building to work from. 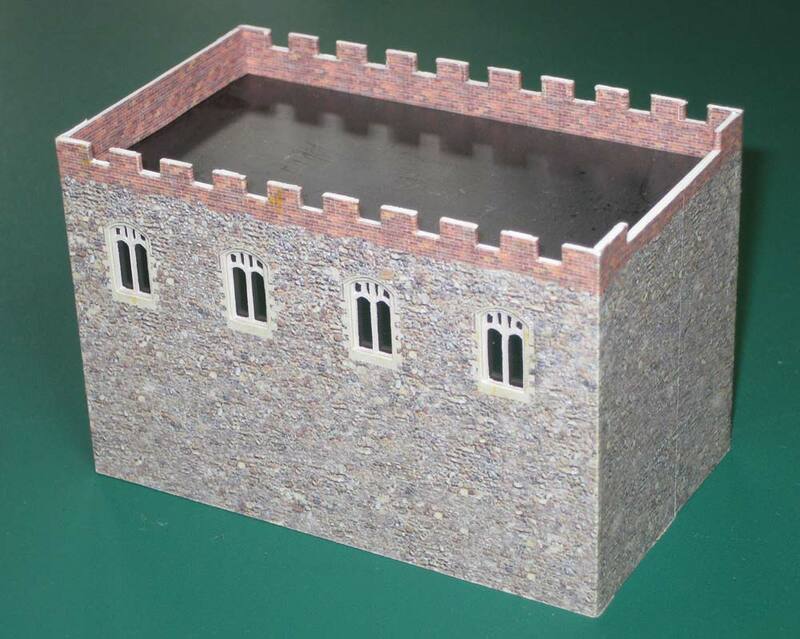 The photo shows the parts for the side walls of the nave with the tracery layer painted with stone colour. 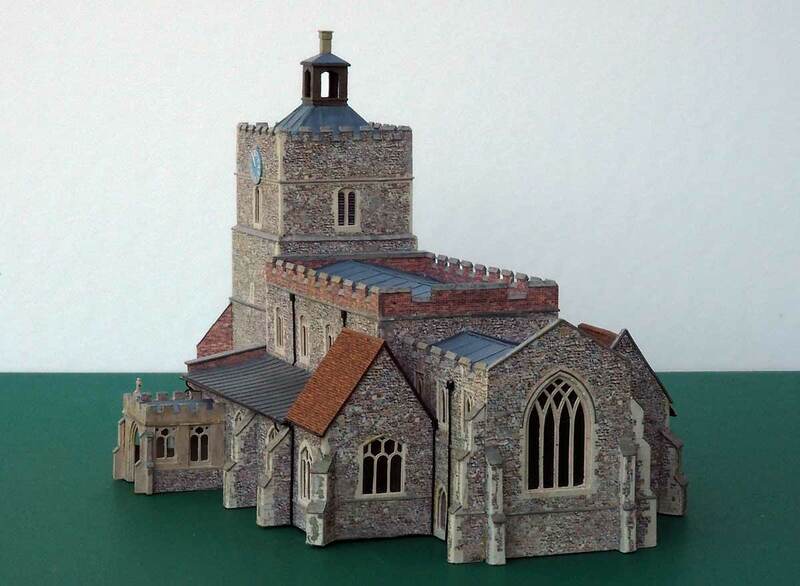 The printed stone texture was developed from a photo of the actual church. This was fixed to the outer layer with a wash of MekPak, the window openings were cut and folded back and then the inner layer was glued into place. Behind that came a piece of glazing material and then black paper. Finally a lining of balsa wood strengthens the whole structure. Here’s how the nave looked at this stage. After the photo was taken small pieces of triangular section Plastruct were fitted to the castellations and painted. When all the sections of the building had been assembled the buttresses, downpipes and other details were added. There should be a weather vane atop the tower, but I haven’t found a way of making anything suitable as yet. Have to confess I'm in awe at the skill and talent shown here. I struggle with some of the more 'complicated' kits! I've not tried many kits but my attempt at making the Ratio footbridge was not exactly a triumph. I felt no regret at breaking it up so that I could re-use the stairs in a scratch built model. Perhaps the instructions could be improved in some of these kits? I did manage the cattle dock but that's not exactly a complicated one! Inspirational modelling of the highest order. 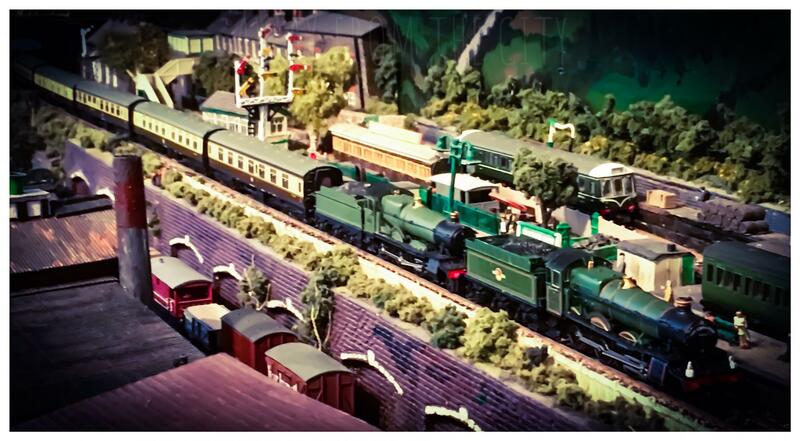 By July 2015 I was thinking about putting together some of the buildings for the right hand third of the layout but first I needed a couple more houses. I also needed some trees. I used a much tried method. Twisting the wire armatures was a job best done whilst watching TV, I found. 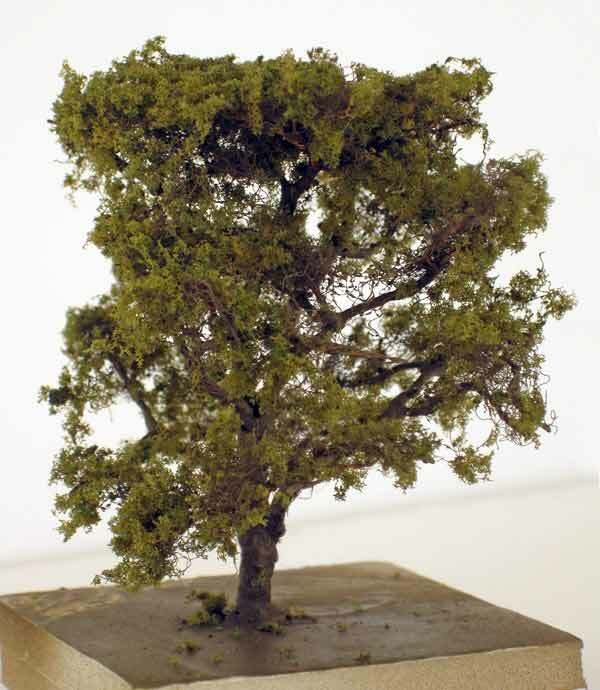 When I was happy with the shape I soldered the wires together to add strength and bulk, working well up the tree. 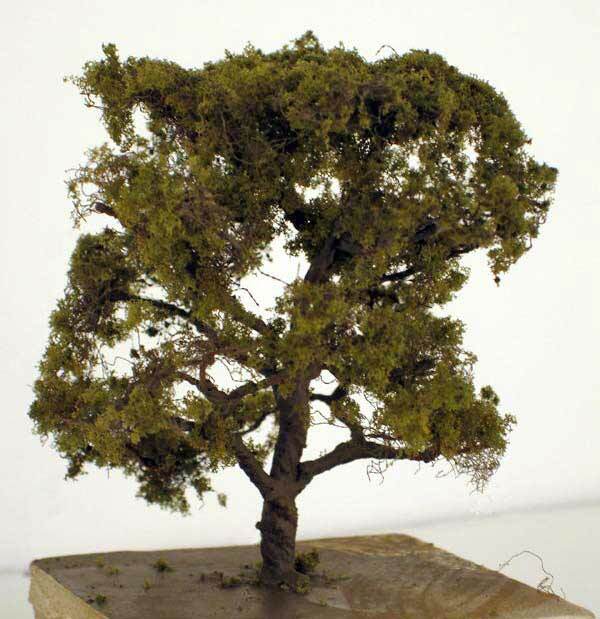 I then coated the trunk and larger branches with a mix of household filler, water, PVA and raw umber artists’ acrylic paint. When dry I added small pieces of the material used to fill soft toys and then sprayed the whole thing with dark brown, adding some variety of colour in the trunk. 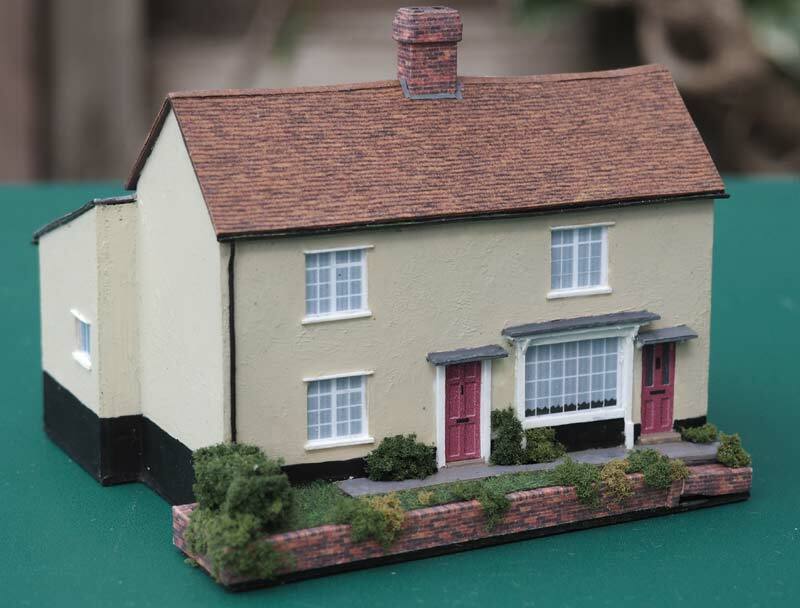 Woodland Scenics coarse turf completed the job, fixed on with hairspray. 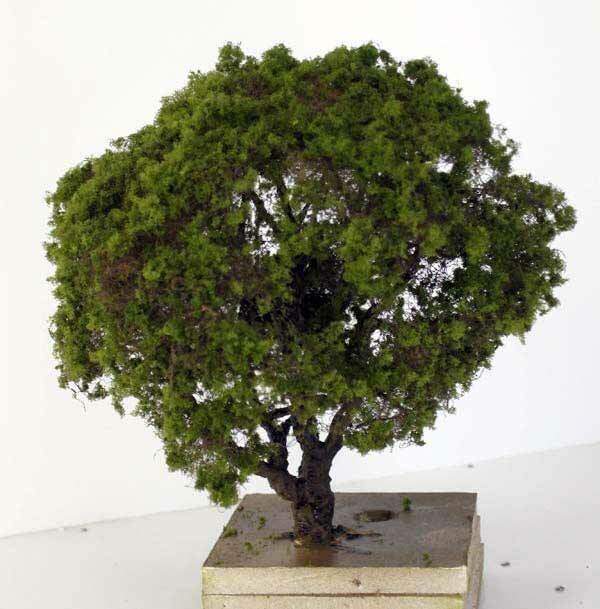 I did later give a spray of WS Scenic Cement to really fix the foliage. 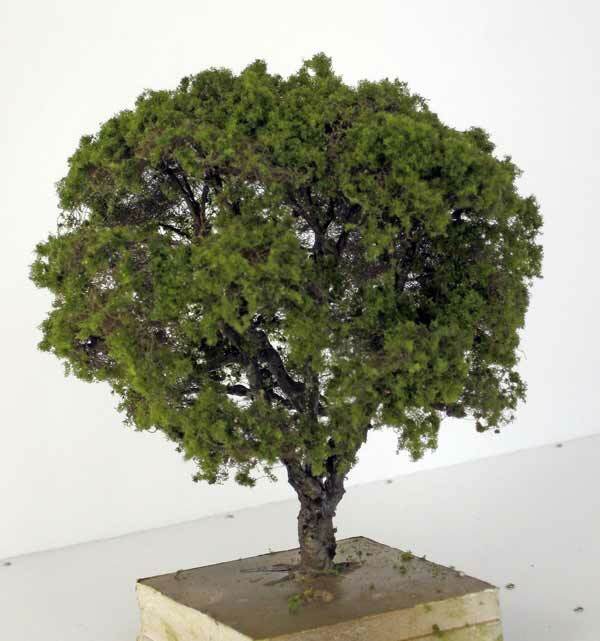 Most of the early trees were placed very close together in order to screen the point where the road hits the back scene so there was probably quite a lot of effort wasted making trees that can hardly be seen. I shudder to think how many hours I spent twisting those armatures. In addition to some groups of trees I needed enough to run along the back of the whole length of the layout, 9’6” in total! Your work is fantastic. I hope you're pleased with it, I would be! I visit the forum often, yet rarely leave a comment. Yet more brilliant work. It just keeps getting better and betterer! Page created in 0.373 seconds with 46 queries.